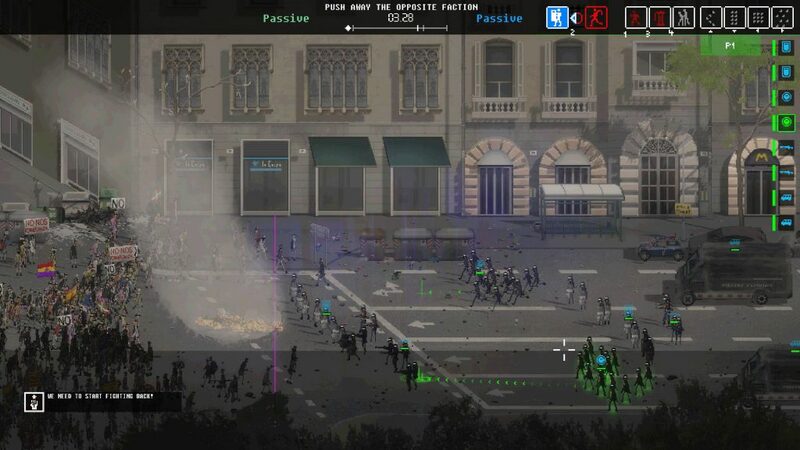 Inspired by developer Leonard Menchiari’s experiences surrounding the Italian NoTAV protests, Riot – Civil Unrest lures players with its real-time riot simulation. But after originally being crowdfunded six years ago, can this game deliver? 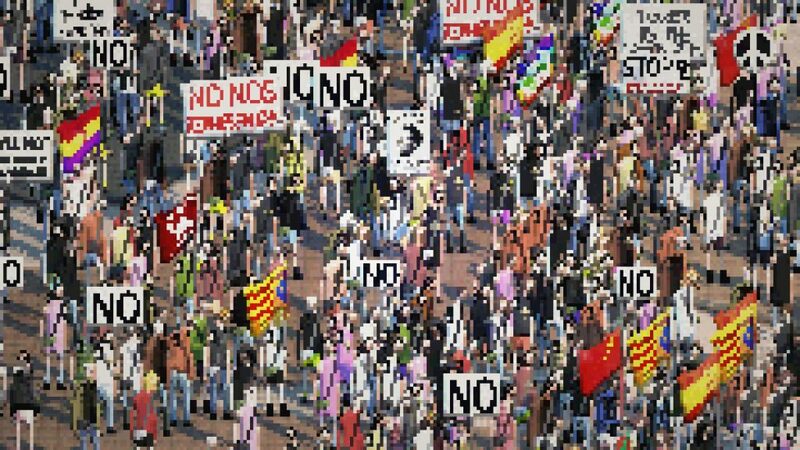 In Riot – Civil Unrest’s story mode, you play as protestors/rioters or police over four campaigns based on real life protests and locations, with the cutscenes in between each level explaining the historical reasonings for the protests. The Egyptian campaign covers the Arab Spring protests which started in 2014 and lead to the overthrow of the Egyptian government, the Spanish Indignados campaign which features the anti-austerity campaigns that took place between 2011 and 2014, the Keratea, Greece protests that took place in 2011 over a planned landfill site, and the NOTAV movement (TAV being Treno Alta Velocita, the high speed train) which protested the construction of a high speed railway between Turin, Italy and Lyon, France. Despite the story mode being very Mediterranean centric, the global mode features thirty scenarios around the world on top of the campaign levels, but the game doesn’t go very deep into the socio-economic and political reasonings behind the protests and riots, preferring to cover why they happen and not how they happen. Despite this, in an era where ‘edutainment’ games are in short supply, this feels like edutainment done right for the modern era. The game consists of playing as two separate factions, police and rioters. As the police you’re lower on manpower but have access to more sophisticated riot control weapons. Whereas rioters have much superior manpower, but less weaponry and the player has less control over them. To win each level in this game, you have to complete the goals of the level, which may consist of getting all of your side to a certain point, holding an area, or pushing back the enemy faction and advancing. The player must balance out military and political scores, as even if you win militarily, you can lose the level politically because you were too heavy handed. The AI will base its reactions in each level based on how you’ve played before, so playing violently as the police will lead to more violent protests and vice versa. At the end of each level you get a newspaper front page with the headline describing the result and a picture of the riot. If you use the camera ability it will be a picture you took on the front page, which is a nice touch. 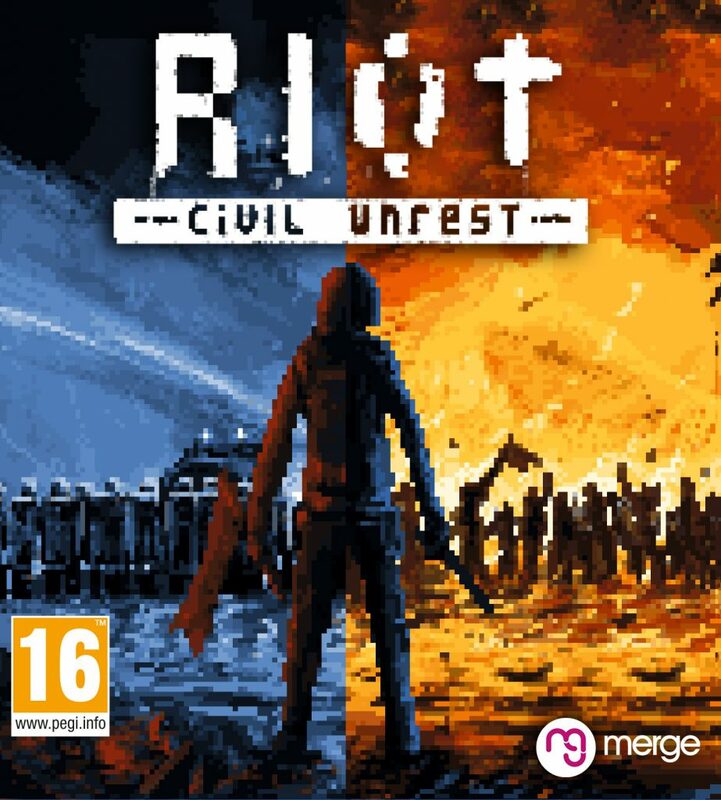 Riot – Civil Unrest features multiple game modes, besides the aforementioned Story Mode, Global Mode has you trying to keep public opinion of your side positive with the levels getting harder if you don’t. On the protest side in this mode you choose special characters who have different abilities and strategies to help your riot defensively or offensively. Along with these modes, the game has a spectator mode where you can set up the riots and watch them happen, journalist mode, which is basically a spectator mode where you’re on the ground taking pictures and could of really been something unique if it was more fleshed out, and on PC, the Steam Workshop levels, where you can download and create your own levels, with many already in the workshop covering the current Yellow Vest protests taking place in Paris. There is also a versus mode, where two to four players can play against each other. According to the promotional material for this game, each individual member of the crowd has their own AI which does make the crowds look natural and realistic, but no matter which side you play as, you feel like you have no control over any of the actions of the crowd, as it feels the game frequently disregards what actions the player wants and due to that, the game becomes a clicking frenzy as you try to control the crowds. The game would of benefited from being able to select multiple units at once (Like Warcraft 3 and other RTS games), when playing at the police you have multiple formations to use, which I didn’t find myself using much outside of the line and defensive formations as the arrow and skirmish formations felt useless when I thought I had situations to use them in. The game, even on higher difficulties, didn’t feel as if they posed any challenge. No matter what difficulty Riot – Civil Unrest was played at, it still felt like I spent the whole time left clicking as I tried to get my troops to listen to me. 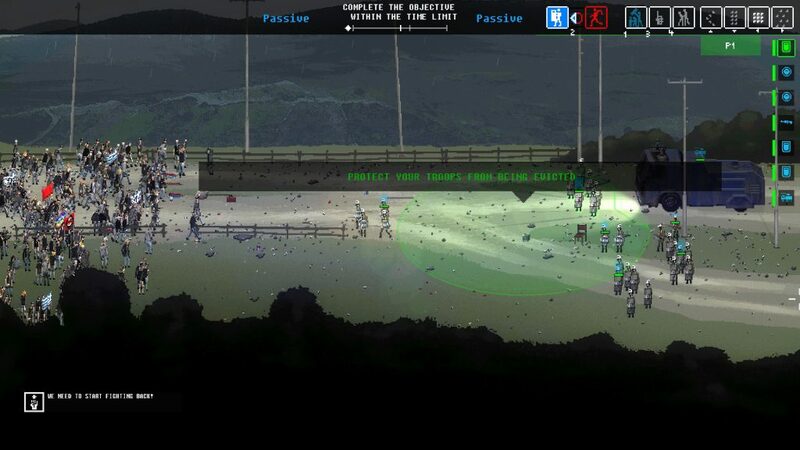 Visually, Riot – Civil Unrest is a beautiful game. It’s 8-bit graphical style stands out well and is really the defining mark of the game. The pixelated styling reminds me of the low-res footage you frequently saw of riots on websites like Liveleak. One of my favourite graphical features has to be the flames from Molotov cocktails, which have a beautiful glow in this game that really helps set the mood. The sound in the game accurately represents what a riot sounds like, chaos. The mixed audio of crowds, screaming, footsteps, police and more all add up to a soundscape that sets the mood of a riot. This is a game made with great love, there’s no doubt about it. 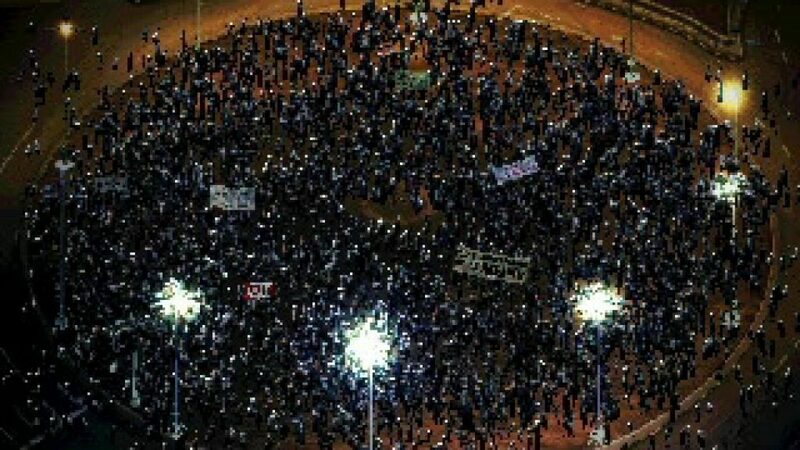 I would have liked it if the game went deeper into the individual stories of protesters or policemen there, as many films, TV shows, books and games around riots and protests have in the past. I strongly believe that if this game released around 2012-2014, it would be making a much larger splash than it is now, as I feel the world has moved on, as it often has, from any major rioting in the last couple of years (although one could point at Venezuela and Paris at the moment, they aren’t on the scale of the Arab Spring) and because of this, the games relevance is lessened. Despite this, Riot – Civil Unrest isn’t a game I’d recommend for everyone. If you’re political or you enjoy the idea of controlling riots, then this is the peak example we have so far of a game in this political genre and you’ll have at least six hours of fun. But if the concept doesn’t excite you, then it’s a game I’d skip at full price. A enjoyable game made with great love, but falls short on controls and gameplay complexity.